Review by AllTheBestFights.com: 2018-12-01, one sided fight between Luis Nery and Renson Robles: it gets two stars. The undefeated former Wbc Bw champion Luis Nery entered this fight with a perfect boxing record of 27-0-0 (21 KOs=78%) and he is ranked as the No.1 bantamweight in the world. 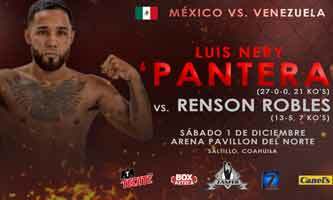 In his last three bouts ‘Pantera’ Nery has won over Arthur Villanueva (Luis Nery vs Arthur Villanueva), Shinsuke Yamanaka (Luis Nery vs Shinsuke Yamanaka II) and Jason Canoy (Luis Nery vs Jason Canoy). His opponent, Renson Robles (who replaces Renoel Pael), has a record of 13-5-0 (7 knockouts) and he entered as the No.226 in the same weight class. He has already fought four times in 2018 losing three times and beating Ronald Marquinez in his last one. Nery vs Robles is the main event of the evening. Watch the video and rate this fight!